It’s great to note despite latitude, my garlic is at the same stage as yours – although they face the same risks from the biting wind! I have not tried no knead bread, interesting idea and your loaf look great. Still waiting on my seed potatoes to arrive ….. The difference is that when I spend hours kneading and proving bread the results are very different to yours 🙂 This no knead method suits my weak wrist and low boredom threshold! I can imagine that the wind is certainly whistling up there at the moment – thankfully garlic is hard! I’ve been wanting to try some no-knead bread too, just haven’t got around to it yet. Yours looks great. I’ve also got to get at ordering some seed..
I’m not surprised you’ve not got round to it – you’ve been so busy! I’ll try some more recipes and do a post if it continues to work out well. 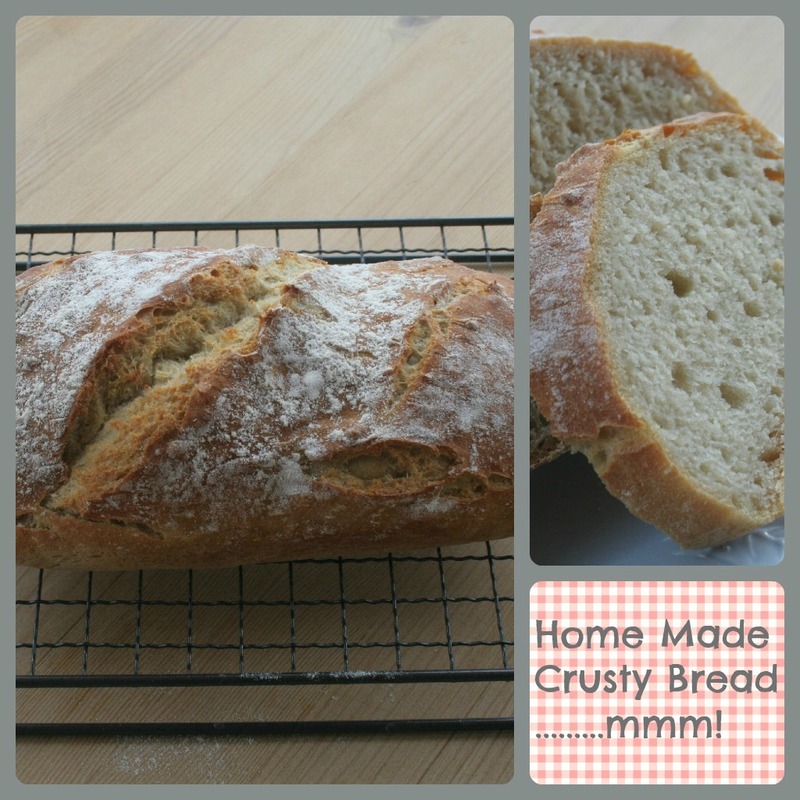 Your bread looks really good – I’ve never tried the no knead method, but on your recommendation I may well give it a go! Probably a good idea not to mix kittens and seedlings. Our cat just loves sitting inside the cold frame on a sunny spring day – usually on top of any seed trays that are in there. so much wonderfulness here PJ! garlic already, and the bread looks delicious, and the tea party sounds a great event to plan and look forward to!! The tea party will be fun and makes these grey days seem more bearable at the moment! My garlic was peeking up in December despite the leaf litter mulch I used….snow has it snuggled right now…I too adore vintage teacups….I will have to check out the 5 minute method for bread baking…sounds right up my alley. It actually takes longer to pre heat the oven than make the bread… and I’m always in “knead” of more time so this method is great! Join the teacup obssessed club – found a fantastic haul for £7.50 the other day. Delighted! Had a friend round for dinner and my afterdinner coffee tasted so much nicer in a gilded 50’s coffee cup and saucer. Fab! You can have a look at my Pinterest board (http://pinterest.com/tuckshopgardenr/vintage-china/) for vintage china to see what I have and what I covet! You are feeding my obsession! Thanks for the link – I’m following your Pinterest board and will keep popping back to see what you have. Drinks certainly taste better in china and I love the daintiness of vintage crockery. A tea party! What fun you’ll have. Oh I can’t wait to read the post-tea-party blog. I know! I’m sure that I’ll be so busy making bunting, cutting the crusts off bread and arranging sugar lumps that I’ll forget to take photos!! You must add “take photos” to your list for the day and assign the task to one of your guests. In the “old days” we put disposable cameras on the table for guests to take pix. Maybe some version of that. I have no earthly idea what “chit” means. The dictionary did attribute it to the English but it seemed to be a short note or memorandum. I feel sure your potatoes aren’t going to be writing notes. Still, it seemed like a Most Excellent idea for allowing them to grow eyes. It’s a funny word isn’t it? I’ve not done a lot of chitting before so it will be interesting to see how the potatoes progress. To be quite honest it’s just great to see anything sprout at this time of year! The bread looks great and the kittens are adorbs! It’s an age since I made bread; in the UK there was always some bread rising in the airing cupboard but here in Queensland the humidiy doesn’t always seem as conducive to baking. Its rainy and miserable thought this week so I might have to break out the cook books again, and I would really love to grow garlic in my garden, can you just plonk in a shop bought bulb that’s already starting to sprout? Awesome, that will come in very handy as I’m writing my Honours thesis on Victorian Gothic Literature this year!! We can grow a good range in the South East of Queensland as we get just enough of a cold snap in winter to set citrus and fruits and then nice hot humid weather. I’ve got lots of green peppers this year which have been great for salads and I have some limes, lemongrass and rainbow chillies so I just need garlic and then I can make Thai curry pastes from my garden! I got my first mango last year which was a bit of a miracle as they don’t usually like salt air and I’ve grown tomatoes and mini aubergines before but I always get invaded by white fly and nasty bugs with anything that has tender juicy leaves and I hate spraying everything with chemicals. 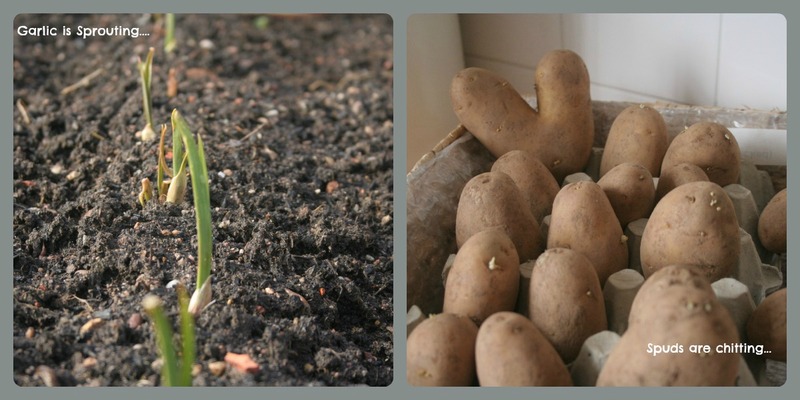 I think that potato is really special, I think you’re right….a good sign for your garden season. I hadn’t heard the term ‘chitting’ before but I’ve also never planted potato’s. Sorry to hear your weather is not co-operating, we’re enjoying sunny but cool days. You’ll have a ball at your Tea Party. Did you know I also collect Tea Cups? For many years I’d pitch a dining tent on our lawn at the lake and had girlfriends over for a Tea Party too. We’d always wear a sundress and hat and we’d pretend we were english LOL…you’ll have us beat on that one. It was always a hit and so fun to plan. The bunting sounds so cute, I can’t wait to see what transpires. Nooo! I didn’t realise you collected teacups but I’m not surprised 🙂 It’s so funny that you pretended to be English… I imagine it was like Downton on the lawn with giggles! Oh, a summer tea party – what a lovely thought on a snowy February morning! I’ve also just started trying bread-baking and had a first success. But I enjoyed the kneading process – to get rid of excess frustration at the weather! 😉 Look forward to your recipe though! I broke my wrist a couple of years ago so the strain of kneading makes it quite achey. I have a food mixer with a dough hook and a bread machine but, I have to admit, the no knead attempt is much better… but that might be down to my bread making skills (or lack of!). This sounds very similar in method – in fact the authors state that the longer you leave the dough mixture in the fridge the better it gets and it will also develop a sourdough flavour. We have just started collecting similar cups, saucers and side plates too. We are starting to open our garden under the National Garden Scheme from next year so we thought crockery like that would feel right. Wow – I can’t imagine my garden ever being ready to open for the NGS! What a great thing to do and the lovely cups and saucers will make people feel extra special. I’ll look forward to seeing your posts about this. I love the tea cups! They are so pretty. As for the bread – it looks delicious! Well done to you! I had put boxwood cuttings in my utility room, without thinking that our cat would enjoy having something new to dig up… Silly me! Garlic looks great, good luck with the spuds! I like the thought of kneading and proving my own bread but the reality is that I don’t enjoy the strain it puts on my wrist and I could use my time better. Homemade bread tastes lovely and the smell is divine! The potato is great isn’t it! No-knead bread sounds interesting, I used to make bread every Saturday for about 15 years, until my arthritis got too bad and I had to stop. I don’t have a kitchen machine and the kneading just got too much. That’s 10 years ago – I haven’t even heard of no-knead bread until now! Looking forward to your next post about it. I still can’t believe that bread that is simply mixed and left is as good as loaves that I’ve slaved over… in fact, in my case it’s better! I’m hoping for a nice Summer but if it is as wet as last year the the party will be indoors. I put a lot of things off last year due to the weather but this year is for ploughing ahead regardless! That bread looks so amazing! store bought really. I love your pic of tea cups too. Should pin that one up. Love the teacups. Will look into that book, thanks for the recommendation. I’ve never mastered bread making and you make it sound easy! 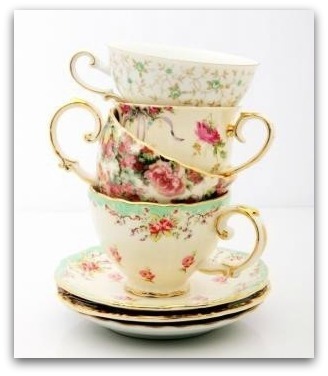 I know what you mean – the little vintage tea cups are so delicate and the china is almost translucent! I’ve decided to use them on special occasions and not get worried if they break. It’s strange to think of the people who may have been using these a hundred years ago though!